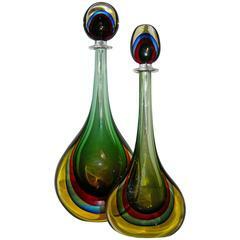 Stunning green, blue and red crystal vase by Murano Italy, midcentury 1970s. It's in a perfect condition. It comes from a private North Italian collection. Is a unique piece. Large and beautiful 1970s vintage mouth blown crystal vase. Large blue blown glass vase. 1970s.